This entry was posted on Friday, June 3rd, 2011 at 4:51 pm and is filed under Book/Film News, Obituaries - 2011. You can follow any responses to this entry through the RSS 2.0 feed. You can skip to the end and leave a response. Pinging is currently not allowed. 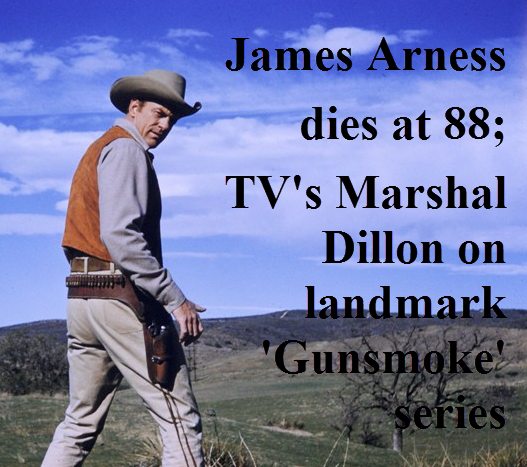 From the time I was able to watch TV till now James Arness was one of my hero’s. My father and I would watch “Gunsmoke” faithfully each and every weak. I’m now 55 and I watch it everyday on “Encor’s” western channel. To me his death brings tears to my eyes. America has lost a great American Hero. I will miss you. I know that he is in heaven standing tall next to the Duke. Thank you James Arness for all the years of enjoyment. Allan, you must be sick of my comments today, but you have as usual so many interesting subjects on your blog today. James Arness as you know grew up in Minneapolis along with his brother Peter Graves. I knew a man who went to school with both of them. He told me they were both wonderful men. Large in size, and equally large in Heart. God bless you Jim for all the episodes of Gun Smoke you made for us. From one Minnesotan to another, thanks for entertaining us all these years. You and Miss Kitty can now have another round at the Long Branch, that is if there is one in Heaven. Rest in Peace, and God bless the Arness Family.